When Dwayne “The Rock” Johnson original left the WWE to become a movie star, it was easy to see him as a star in the same vein as Arnold Schwarzenegger: A heavyweight presence who may not have a decent set of thespian chops, and would do little else but wield large firearms with remarkable ease and walk away from explosions like the coolest guy around. Looking back at Johnson’s Career now that he’s been branded the year’s highest paid actor by Forbes, it’s nice to see what Johnson achieved by not only picking the right franchises but by utilising his charisma well and making varied choices. True, Arnie doesn’t hold the same type of charm as The Rock, but it suggests that Johnson may not struggle with “collateral damage” in the mid-life of his acting career. It’s that Johnson charm which makes the Kevin Hart vehicle Central Intelligence watchable. This is a writer who doesn’t dislike Hart in any real way. He’s relatively inoffensive and a decent stand-up comedian. However, watching Central Intelligence, in which Hart plays an ex-high school athlete, now forensic accountant, it’s still hard to see what his appeal in cinema. 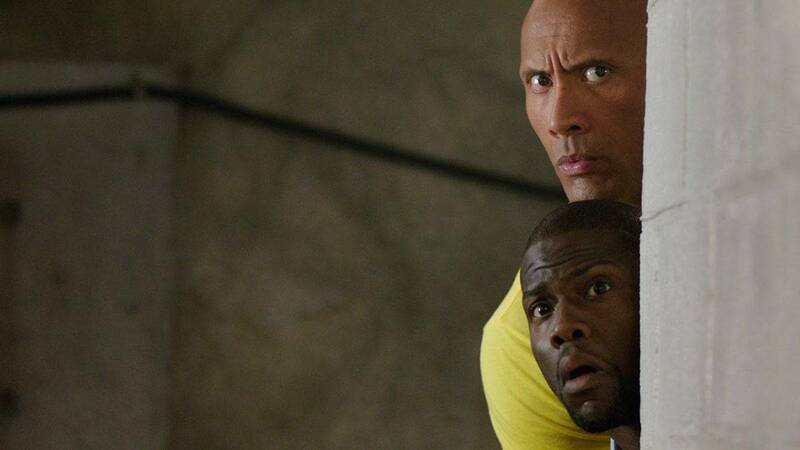 Despite holding less of the stereotypical black film tropes, that stars can often get lumbered with, Hart’s hyperactive manner does little to impress. Hart’s forensic accountant character of Calvin Joyner has one foot stuck in the nostalgic past. Joyner’s dreams of becoming his high school classes most successful graduate have been dashed by cold hard reality. He’s stuck in a dead-end job, passed over by younger grads, while his wife (Danielle Nicolet in a pretty thankless role) is now looking at therapy in order keep their marriage on track. When a Facebook request from Bob Stone (Johnson), an ex-classmate lands in his inbox, Joyner is thrown into a world of espionage in which Stone requires Joyner’s accounting skills to seek out a plot hatched by the mysterious Black Badger. Central Intelligence has a little fun in playing with the idea that Johnson’s Stone was the unpopular fat kid in school, while Hart’s Joyner was receiving all the accolades. Now the roles are reversed with Stone is the super cool spy and Joyner is the reluctant fish out of water. You’d think that Rawson Marshall Thurber’s film would be a little bit more ambitious with this conceit. Alas, what you see is what you get here. The film’s narrative is really quite flat. As are the sub-plots, such as Nicolet’s role as the ex-high school sweetheart now wife, being a wasted venture. Don’t expect the screenplay to provide much in the way of surprises. What Central Intelligence does have though is Dwayne Johnson, whose Unicorn loving Bob Stone is a giddy ID character stunted in arrested development. Johnson’s energy and commitment to the role is what keeps Central Intelligence from dying on its feet. His chemistry with Hart is palpable, and being no stranger to action, he aces the simple set pieces placed before him. While the film feels like a missed chance of sorts, Johnson shines in most scenes that he takes part in. Reminding us of just how much of a movie star he is. Central Intelligence did decent bank at the box office, and it’s not hard to see why. It demands very little from its audience with its hit and miss gags and standard action sequences. It’s an easy watch. However, by being such an easy watch, it only makes you realise just how enjoyable Dwayne Johnson is doing as a star. This feels like a loss, until the next Fast and Furious entry rears its head.